Daniel Tammet is a unique person. He has Asperger syndrome, yet is a savant who can recite pi to 22,514 digits from memory. He remembers every number up to 10,000 as having a unique color, texture, shape or feel, but can only recall faces on the level of a 6-8-year-old. He changed his name to his current one because he felt that his name didn’t reflect who he is. (He took ‘tammet’ from the Estonian word for ‘oak tree’.) His words about weaving are almost certainly entirely metaphorical, but can be taken more literally by weavers who are familiar with connecting actual threads into cloth that becomes more than just the sum of its parts. I have talked before about preserving memories with weaving, making memory rugs and other pieces to keep important textiles close to us. To continue Tammet’s metaphor, we weave thousands of (literal) threads, already made up of thoughts, feelings, memories and ideas, into something entirely new, something that didn’t exist before at all, yet now not only contains all of those thoughts, feelings, memories and ideas, but holds new ones of its own. I like to weave with rags when I know their history and can fully appreciate all of those factors, but I also like to use rags that I don’t know anything about, such as thrift shop finds. I imagine that the memories in those threads, although unknown to me, are still contained in the new thing I am making. The reason that we are making something, or who we are making it for, is also woven into the cloth. Sometimes, it is nice to just focus on a very simple project that is important to you. When I was a child, we had (in my opinion) the best neighbors in existence. Ours were the only two houses adjoining each other for the entire length of the dirt road, so not only were we each other’s only neighbor, there was no larger ‘neighborhood’ to be a part of. When we moved in, the family (parents and two children) brought us food and welcomed us to the area. My parents and the next-door couple soon became good friends and had a standing date to play pinochle every Friday night. Their daughter, Lisa, became our babysitter, and I can unequivocally state that there has never been a better babysitter in the history of time. She took care of us after school and in the summers. She was the coolest person I knew–she threw a discus, did archery, and went to medieval festivals in full costume, long before ‘cosplay’ became a popular thing. She could do beautiful calligraphy and had two great Persian cats that lived in her room. Among other things, Lisa introduced my brother and me to Dungeons and Dragons™, which we loved. (Why, yes, I am a geek. Did the weaving and the oddly specific fixation on sakiori not tip you off?) While our parents played pinochle, we were exploring monster-infested ruins and getting involved in the political intrigues and wars between city-states—almost all of which came straight from Lisa’s imagination, not pre-written modules, and were completely customized to our age and interests. When the weather was nice, we played a live-action version of the game (which is something popular enough today to have an acronym, LARP, = live-action role playing) by running around on our four-acre field and forest, completing missions and fighting the bad guys who had taken over our father’s kingdom. I will never forget how much time, energy and creativity Lisa put in to something that could have been just a boring babysitting job. These experiences still influence me today. She taught me to have fun, let my imagination run wild, and that it is okay to be different. Lisa’s mother, Marion, did something else very important. When my family was going through some extremely difficult challenges, she stepped in and helped guide us through them. I will always remember and revere her. Marion passed away many years ago, but I still think about her often. Lisa and I reconnected via Facebook several years ago, and she recently got in touch asking if I could make her a simple rag rug. I was so happy to be asked to do something for her and excited to be able to give something back as a thank-you, however inadequate it is. At first, Lisa said she just wanted a typical rag rug. Since I didn’t have a lot of them in stock and was planning on making one just for her, I asked her some specific questions about size, color and finishing. 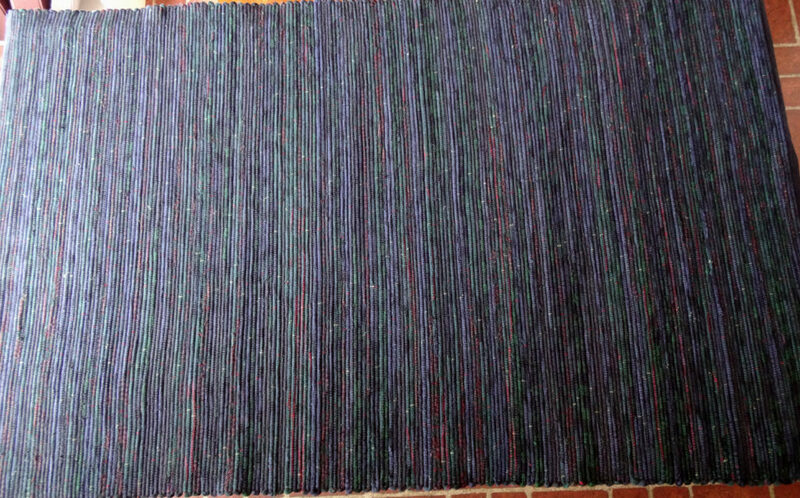 The rug I ended up making was approximately 3′ x 5′, mostly dark blues and greens, with rolled hems. I used dark blue carpet warp (8/4 cotton) and decided to use all 100% cotton flannel rag, which I found at the thrift shop. About half of the rags I used came from a great flannel plaid sheet set I found, and the rest were flannel shirts and pajamas. 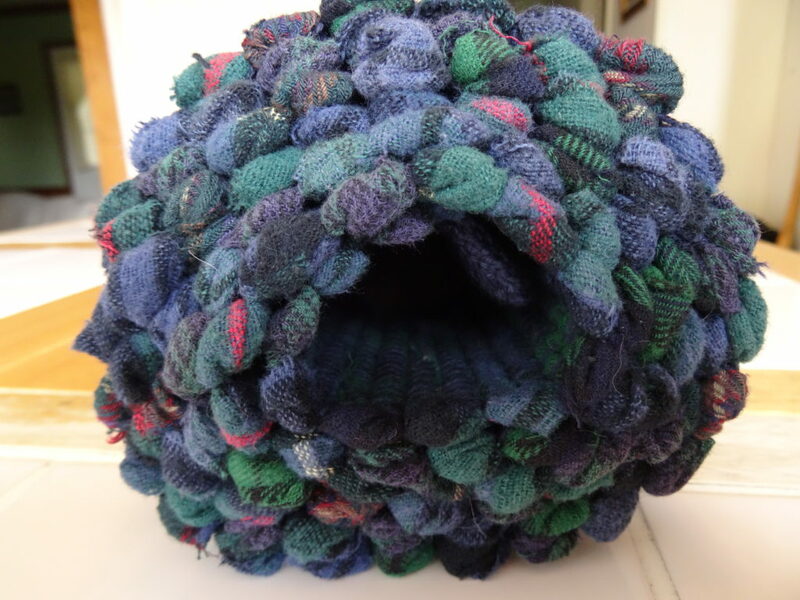 I made a basic rag rug in plain weave. The rug came out beautifully, and I feel like it is the kind of color and size that would work for almost any room in the house. I will definitely be making other rugs in this more sophisticated palette. For anyone who is curious about the specs, the project instructions are below. Wind a 3-yard warp of 456 ends. Warp the loom and set up for plain weave. 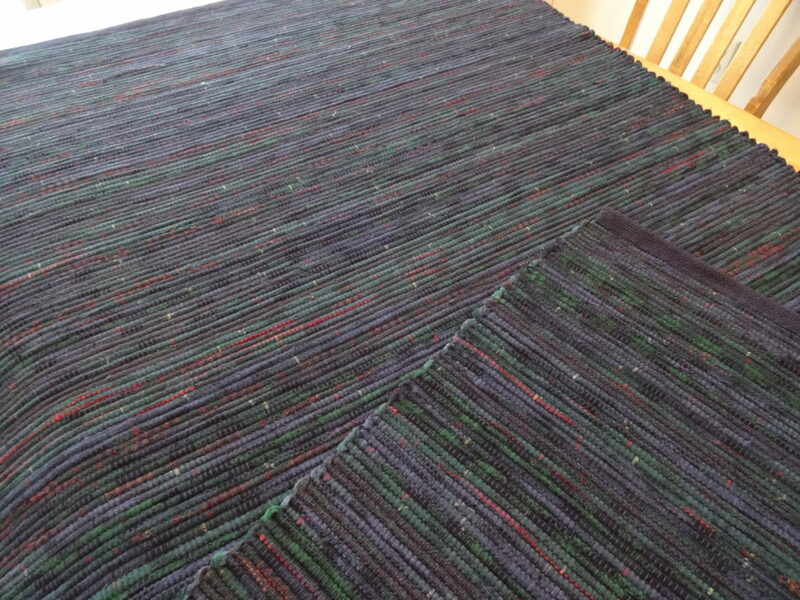 Weave a header to spread the warp, then weave about 1-1/2″ of doubled carpet warp as weft for the rolled hem. 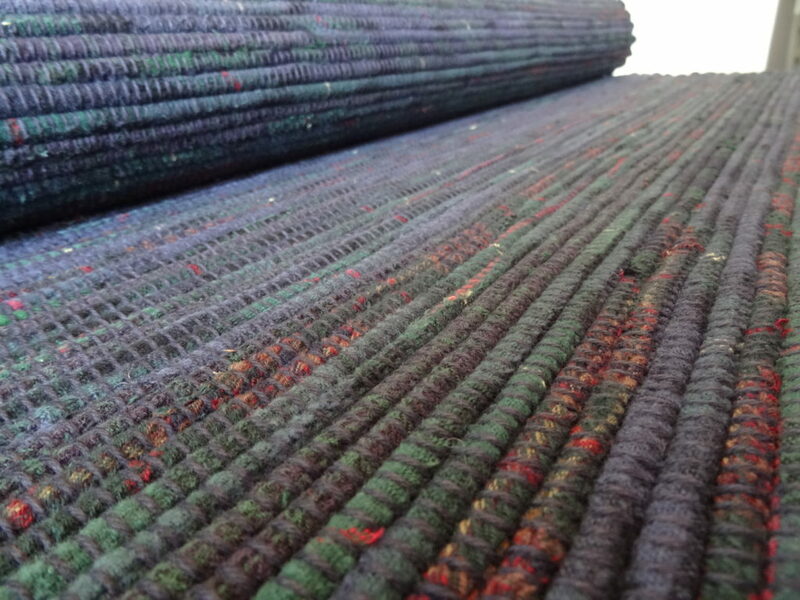 Switch to rag weft and weave until rug length (including hem) is 73-1/2″ under tension, then repeat the hem. Weave waste yarn to secure your hem; cut from loom, roll hem and sew. What Memories Have You Woven? Leave a comment about something you wove in order to preserve an important memory! Follow Western Sakiori on Facebook! It’s Release Day! And a Giveaway! © 2019 Western Sakiori. All rights reserved.